Ohmyheavens! I love my daily Cappuccino. It’s the ultimate morning wakeup call for me. I have a Kuerig machine to make my coffee, but you DO NOT need one to make cappuccino. Any coffee maker will work just fine. All you need is the milk frother. That’s the nifty device that turns your milk into foam. But I’ve learned through trial and error that not all almond (or other nut) milk will froth. And be mindful not to get a brand that has carrageenan in it. So far the brands that froth the best for me are: Elmhurst, SO, and Silk (though I stopped using Silk because of questionable ingredients). Also, my homemade nut milks have given me a little froth, but not quite as good as Elmhurst or SO brands. 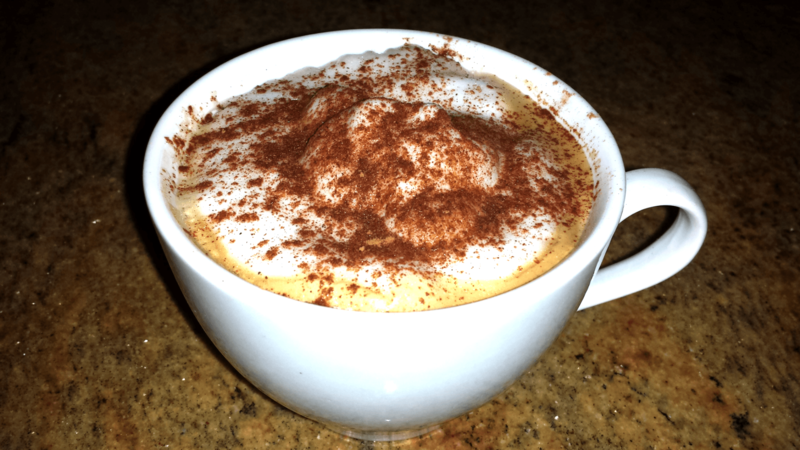 So here’s the recipe for the best darn cappuccino in the world. Starbucks can’t even touch this! – About 1/2 cup of UNSWEETENED Almond Milk. Right now I’m loving the brand Elmhurst. They have various nut milks with the best ingredient list I’ve seen. My “go-to” has been their Cashew Milk, but their Almond Milk is awesome too. I tried the Walnut milk they have but that one didn’t foam for me. Sometimes—when I have time—I’ll make my nut milk from scratch, but honestly Elmhurst foams up so much better than homemade. It’s absolutely perfect foam! Pour the foam on top of the coffee, then sprinkle fresh ground cinnamon, raw cacao, pumpkin pie spice, etc…or whatever flavor you desire. I pre-make mine sometimes so my fave combos are always ready to use. This entire Almond Milk Cappuccino is around 20-40 calories depending on how much unsweetened almond milk you use. If you must use a sweetener, try natural ones like organic Stevia, monkfruit, or coconut palm sugar. Do your best to avoid artificial sweeteners. My go-to is organic Monk Fruit. It measures just like sugar and tastes the best. You can explore more about it here in a post I shared. Are you a coffee lover like me? If so, how do you like to drink it? PS: Are you ready to kickstart or revamp your healthy lifestyle goals? I’ve totally got your back! Click here to check out my 30-Day Weight Loss & Fitness Challenge now. Do you know if homemade almond milk will froth? I’ve never made my own almond milk before so I’m not sure if it froths or not. I do know the only store brand kind that will is Almond Breeze out of all the ones I’ve tried. Since I first wrote this post, I’ve made my own almond milk, cashew milk, and all kinds of other nut and seed milks…and so far, most of them have frothed. My almond milk did great, though the Silk brand does have a thicker froth. Where can I buy the almond breeze unsweetened milk that froths.please. I only see So Good & inner goodness in my local shops. Neither froth. Try Thrive Market or ask your local grocery stores. What you want to avoid when buying nut or seed milk is “carrageenan” (which is toxic in our bodies). Perhaps check other packaged items you get to ensure carrageenan is not an ingredient in them too. I just found this post and it totally saved me! I really like having afternoon cappuccinos, but only had almond milk in my fridge. I followed your advice since mine happened to be unsweetened, and voi-la! Almond milk foam! Thanks for the afternoon lift! I’ve tried three brands of unseeetened almond milk; California, Silk and Blue Diamond. I cannot get a good froth from any using my Aeroccino. Suggestions (I’ve followed the tips in your post).